I haven’t a clue how much this will set us back, so it’s a bit of a gamble! In this part, I’m going to focus on a couple of players that I’ll be giving a shot with the first team this season. I’ll cover some of our other youth prospects in Part Nine. I already mentioned Fynn Otto and Patrick Finger in Part Six, and they will be in the squad for sure. But he has developed well after a couple of loan deals, and deserves a shot in the squad. 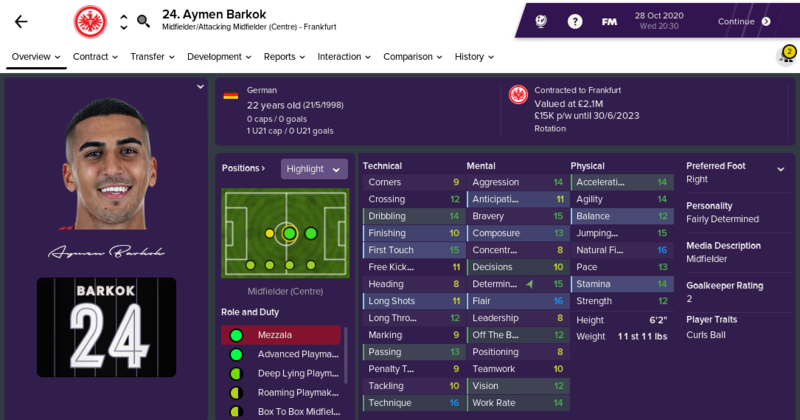 He’s a homegrown player for Frankfurt, and he’s capable of playing at right back too, which seeing as we’re rolling with a more streamlined squad than usual, could be useful. 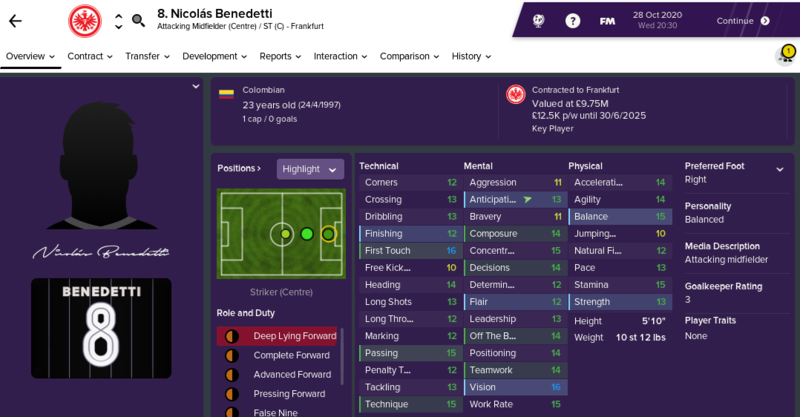 Out of everybody, he has shown the most improvement in training, and even though he’s only 17, he already looks good enough to earn some first team reps. He’s been with us for a year after we snapped him up for a mere £100k from Pro Vercelli at the start of last season. Luca is the reason I’m only looking for one forward in the transfer window, and Barkok is the reason I feel we can get by without signing a central midfielder or a right back. We had just under £30m to spend, and considering our youth prospects, I felt we needed to get four players in, in the following positions; GK, M/AM(L), M/AM(R) and ST(C). Our scouts deserve a massive shout here, unearthing all five of these guys. He had a release clause of £10m to foreign clubs, and we signed him up quickly before the other interested clubs (including Bayern and Fiorentina) had a chance. 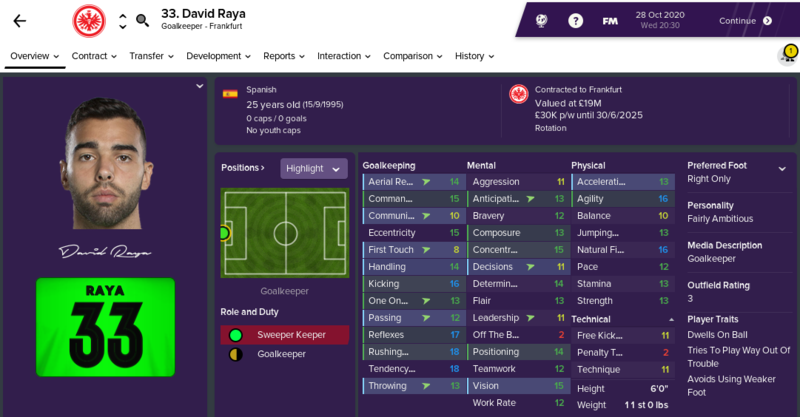 Signing players from Colombia almost feels like cheating, they tend to be so cheap. I’m planning on training him as a deep-lying forward. All three of these signings fulfill our attribute targets of aim number three. Both ‘keepers are listed as squad rotation and I’ll likely divide their starts fairly equally at first. 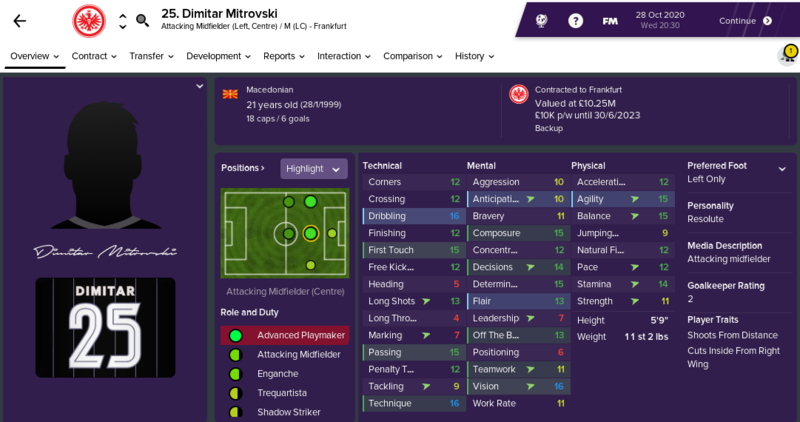 I wanted four players, and we’ve filled every position with a million to spare in the budget. As a result we won’t have to consider signing a single player on loan this season, which I’m very pleased by. Lastly, we stole Wyn Pritchard from Wrexham’s U19 team and his youth contract. He has a bit of potential as a playmaker and will head out on loan. 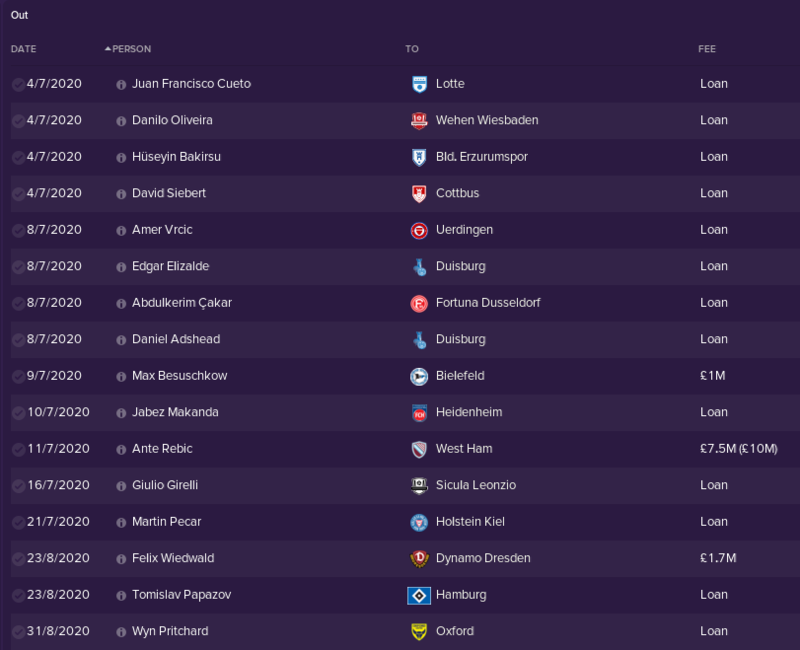 A lot of developmental loans, including players on their last chance to impress, and others that I hope can return and vie for first team football. There are three proper sales. Max Besuschkow had spent the duration of this save on loan, and we sold him at the earliest opportunity. Felix Wiedwald wanted first team football and was never getting it here. And Ante Rebic. We got very little from his sale, with half going to Fiorentina, and almost a million going to him, but we stuck a clause in so we get 50% of any profit West Ham make on him if they sell him in future. Perhaps the biggest change however, is the change in my attitude to loan signings. I’m done with them. We’ve assembled and developed our squad of youth players enough now, that if injuries hit, we’ll be calling them into the team instead. Of the loanees we had from last season, only Ben Woodburn was a target for me this summer, and we couldn’t get near affording him. 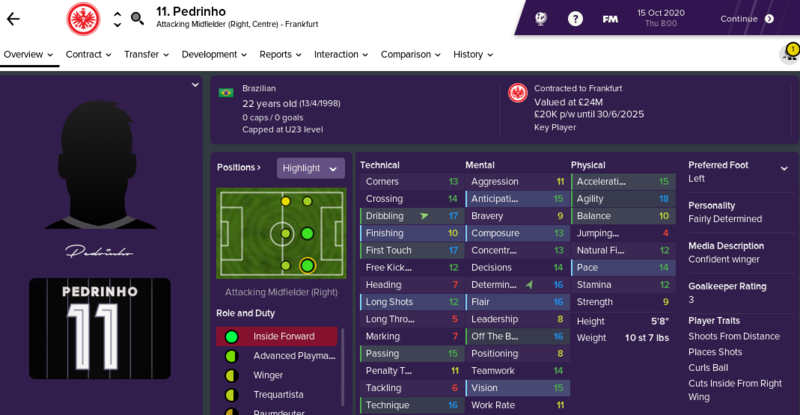 In terms of shape, I’ve just pushed our right winger into the AM strata, to try and take advantage of Pedrinho in his favourite position. Left winger now on attack, left back on support. Small changes. But I’ve added a few instructions. I’ve brought back “work ball into box” to try and reduce our long shots. 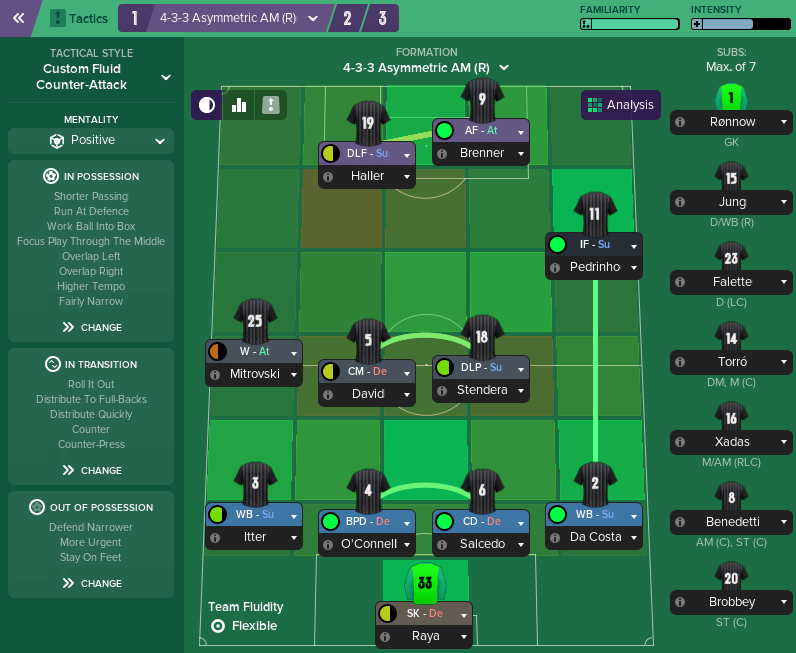 We’ve looked most dangerous on the wings when our full backs overlap, and to that end I’ve added that instruction for both flanks. But we’re going to focus through the middle to try and maximise what we get out of our playmaker and hopefully the deep-lying forward. In transition, nothing’s changed, but there’s a slight change with the out of possession instructions. Out go the deeper lines as we’re a more attacking side now, but “stay on feet” returns, because I’m an angel. And also because I hate being caught out after someone’s dived in rashly. We started the season like we’d been shot out of a cannon. I think the squad must’ve done all their homework over the summer, as they look good. The DFL-Supercup is ours again, with a terrific victory over Dortmund. Brenner is looking lethal, whilst Pedrinho has fit straight into the side, offering some thrust through his direct running on the right. We face a couple of good teams, but that’s why you want to be in it, to face the big guns. And after how our first crack at it went last season, I’m hopeful we can progress again. In what has been an unexpectedly successful save so far, this period stands out as our best by a long shot. We’ve played some wonderful stuff, and beating former bogey side Dortmund away twice in our first seven games is a particular highlight. All of our new signings have started well, and even when we’ve significantly rotated the squad, the second string have done very well. A peak behind the curtain; at 3-0 up against Mainz I claimed on Slack that I thought I’d broken FM. I’m stunned I didn’t lose after such hubris. Although the 0-0 draw in Lyon brought our incredible scoring streak to an end, I’m happy with the result as they look a strong side. We were really excellent against Man Utd though, going 3-0 up and cruising with their goal a last minute consolation from a corner. We made them look ordinary and my faith that we can progress to the knockout stages of the Champion’s League has been boosted. 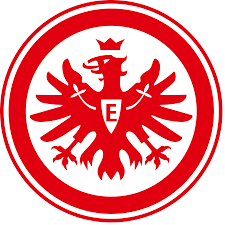 For the first time this season, we were legitimately awful at home to RB Leipzig. They’re a decent side, but we didn’t show up at all and actually deserved to be defeated. Something to ponder. 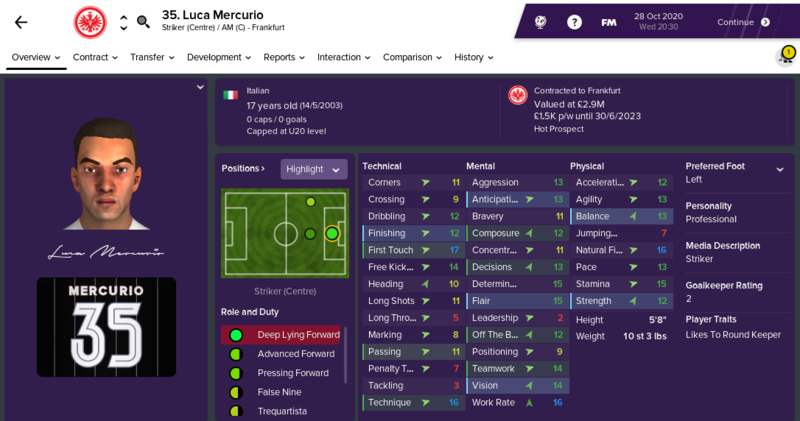 Our cup game against Ingolstadt was a chance to blood some youngsters, and in his first start for us, Luca Mercurio was mercurial (good one), his finishing belying his young age. We’ve looked good at both ends of the pitch, and even now that our performances have declined a little, we’ve shown the strength to grind out results. Also, we haven’t been knocked out of the cup in round one this season. Don’t think I didn’t notice that we went three months unbeaten. I’m incredibly humble… Also our next game is away at Man Utd, so it may not last much longer! Next time we’ll cover the next three (or four) months of the season, including the January transfer window. Thanks for reading!